Dress for the Occasion: A Guide to Dress Codes #infographic ~ Visualistan '+g+"
Have you ever misinterpreted an invitation’s dress code instruction? If so, you’re not alone. Unless you constantly read up on fashion categories, you probably get confused at the plethora of dress code labels that show up on invitations. What you wear to an important event can make a huge difference in the impression you make and the level of confidence you have as you mingle with other guests. Today’s dress codes have a lot of gray areas and fashion norms change constantly. It can be hard to differentiate between garden-party attire and semi-formal clothes. Even when an invitation says, “Come as you are,” it’s hard to tell exactly where to draw the line in terms of dressing casually. It's important to put your best foot forward when attending a social event, which means you need to know how to nail your outfit from head to toe! 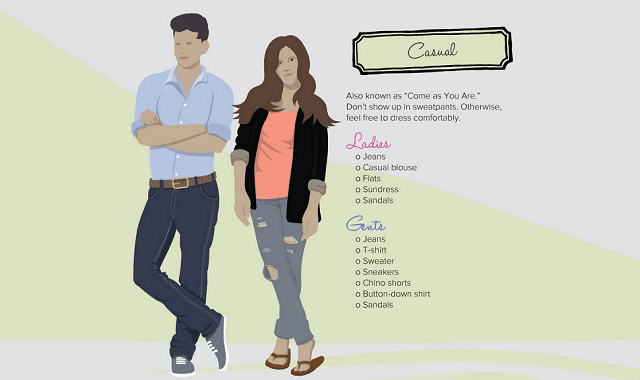 To crack the dress code on your invitations, take a look at this infographic.